Why is The Batman such an ambiguous figure? 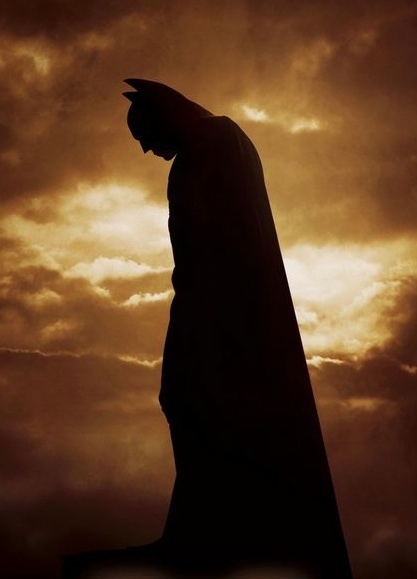 Unlike Superman or Captain America, the Batman, dark and brooding, casts a frightening silhouette against the night sky. Like most superheroes, the Batman keeps his identity hidden behind a mask. But why doesn’t he adopt a more wholesome appearance? Make it clear that he’s one of the good guys? Instead the Batman chooses to imitate the very criminals he’s out to capture. It’s no surprise then, that throughout the comic’s history, the people of Gotham turn on their protector, time and again. 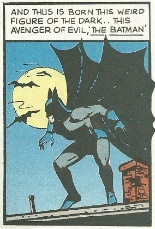 Must the Batman be so dark and mysterious? In the sixth issue, DC #33, we get his back story: The boy Bruce Wayne, in the course of an armed robbery, witnessed his parents’ murders close hand. Kneeling at the side of his bed, he swore to avenge their deaths by dedicating the rest of his life to warring on all such criminals. 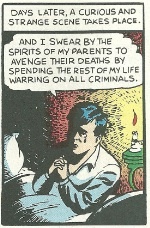 At first glance, Wayne appears to be a run of the mill vigilante. Motivated by revenge, he takes the law into his own hands, imposing justice in a society plagued by crime and corruption. Hmm… is that legal? 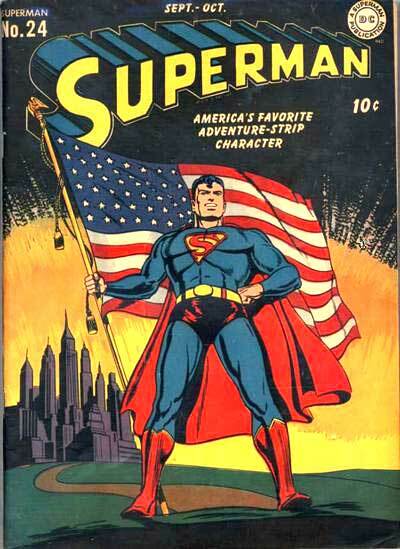 The fact is, the advent of the Batman Comic coincides with a specific moment in American history. In the first decades of the 20th century, an unmitigated rise in organized crime, political corruption, bank robberies and lawlessness, left honest officials and the American public feeling helpless and demoralized. I suggest you Google “Al Capone,” “Bonnie and Clyde,” “Baby Face Nelso, and “John Dillinger” — you’ll see what I mean — why comics from the 1930’s glorified vigilantes, self-appointed crime fighters, like the Batman, who took matters in to their own hands. But unlike the typical vigilante, Batman doesn’t inflict his own punishment or exact personal revenge upon the criminals he apprehends. He almost always turns the criminals over to the police. But again, given his cooperation with the justice system, I can’t help but question his choice of disguise; it’s a bit over the top. Vigilantes tend to hide their identities to avoid being caught. 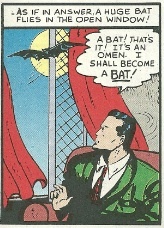 Why does Bruce Wayne choose to imitate a bat: with a cape that extends like bat wings, with gloves are clenched like bat claws, wearing mask resembling a bat’s head with pointy ears and slit eyes. Wouldn’t a simple Lone Ranger mask suffice? Why the bat costume? I suspect Batman’s disguise serves another purpose altogether, that his role is far more dark and mysterious than that of any vigilante. That is, Batman stands, a lonely silhouette, on the brink between a break down of law and order and it’s descent into complete lawlessness. 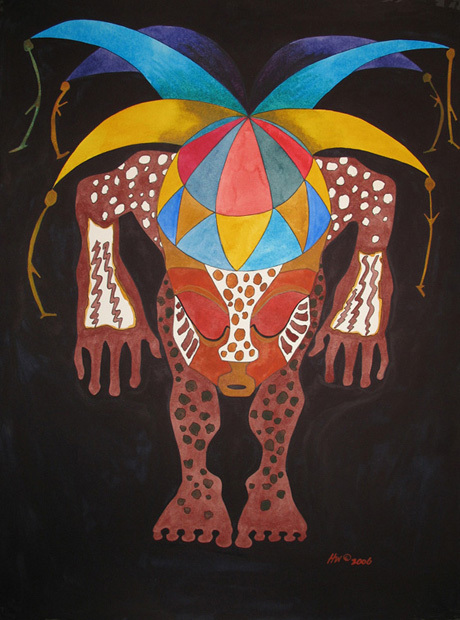 The shaman imitates the animals and the monstrosities breaking down the community from within. 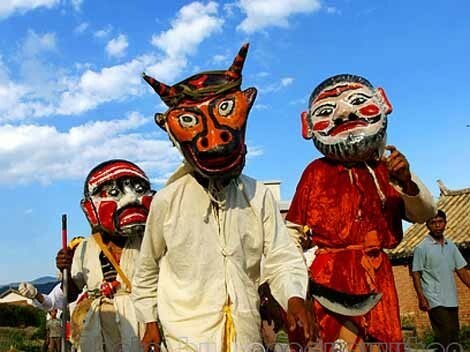 On some imaginative level he’s able to harness and redirect these “evil forces” into rituals w hich restore order. Like the shaman, Bruce Wayne enshrouds himself in the same stealth and cunning the crooks and robbers use to prey on their victims at night. Masked as a bat, an ambiguous creature which is neither human nor divine, Batman is the only figure able to master these lawless animals and round them up fo r prosecution, he is the only one to command order out of chaos. 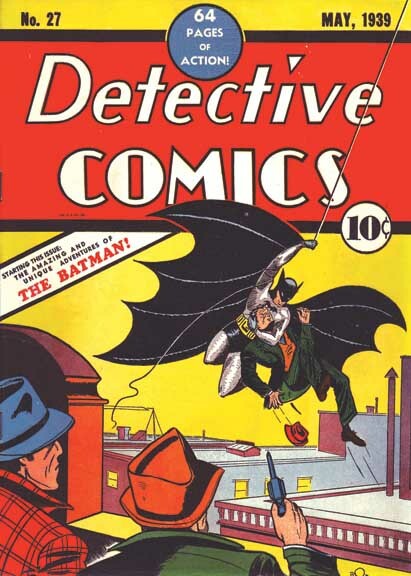 But there’s more: The first issue of Batman (DC #27) appeared in May 1939, on the eve of World War II, coinciding with the birth of the superhero genre as a whole. Preoccupied with internal tensions, the US did not enter the war until two years later. It took time to shift her internal energies, and especially the public’s attention, outward. 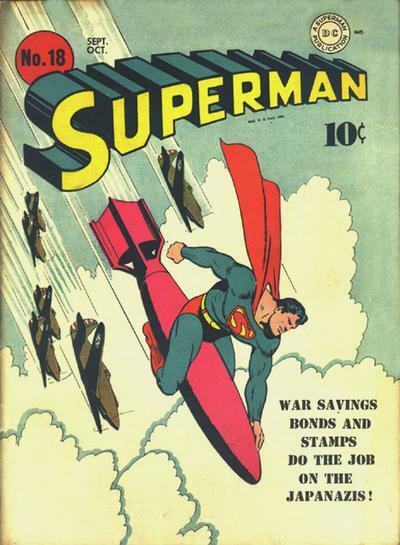 In more ways than one, comics played a significant part in this, beyond just recruiting America’s youth for the war effort – once America mobilized all her resources for war it didn’t take long for a new order to emerge: within a decade the US became a world super power. The monsters at home which had plagued the population for decades were finally subdued as our internal lawlessness was redirected towards foreign enemies: Germany and Japan and later the Soviet Union. On some imaginative level Batman stands at the nexus of this process, rounding up the internal forces threatening the community from within and redirecting them toward a common enemy. But again, Batman is not the one to carr y justice to its socially sanctioned ends, that’s left to the unambiguous heroes of the new order: Superman and Captain America.